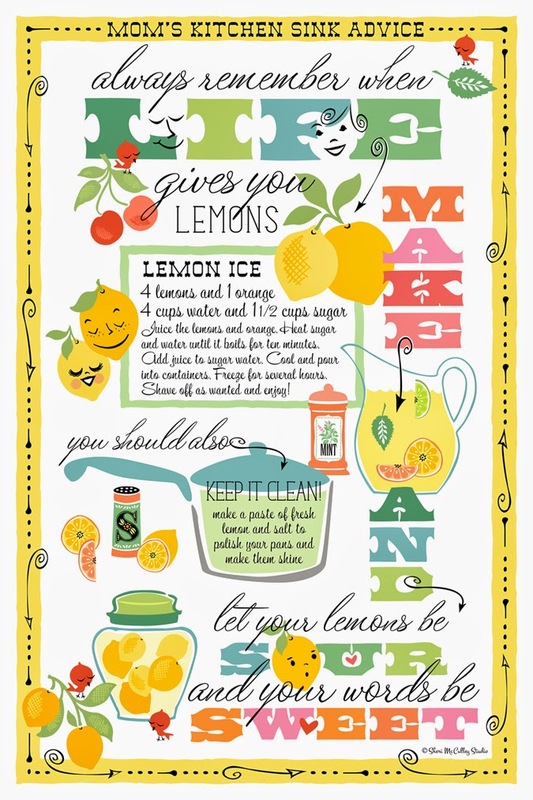 Sheri McCulley Studio: When life gives you lemons . . . you know what to do! When life gives you lemons . . . you know what to do! Well, I knew what to do anyway. I have been working on opening my shop on Spoonflower (an online textile, wall covering, gift wrap company). You can click on the link to my shop at the top, right. For those who don’t know Spoonflower, they have a weekly contest with a design theme and I have entered a few times. I’ve made it into third and second place, but this time I am hoping to win that sweet spot and turn these lemons into lemonade. I am planning to create a set of tea towels with the “Mom’s kitchen sink advice” theme in the future that I will have in my Spoonflower shop along with this one. However, first things first. If any of you would like to vote for my design, I would love that, but no pressure. I won’t be sour if you don’t, ha ha. I will attach the link and you can vote only once to count. You have until Tuesday, May 6, I think. You do not have to sign up to be on Spoonflower, so no pressure from them either. My art that you are looking for to vote on is above (the lemon theme). I have decided that if I win the tea towel contest this week I will have my own drawing on my FB artist page for anyone who lets me know they voted for my design. You simply have to get on my page and say “I voted” and I will enter you into my drawing. But again, I can only have the freebie tea towel drawing if I win, so if you get your peeps to vote, that will make a difference too. You can tell them if they want in my drawing they will need to “like” my FB page and let me know they also voted on Spoonflower for my tea towel design. Here’s the link to the Spoonflower weekly contest (the recipe tea towel contest), then when on scroll down until you find my art, click on the check at the top, left of my design (which by the way will be sideways, the art that is) and submit your vote. If you want to tell me you voted, go to my FB link and say so in a comment below the image of my tea towel design. Then if I win, you can be in my own free tea towel drawing on Facebook. If you want to see my Spoonflower shop you can go to this link. I have a few collections up, but more to come in the future. Please note, some of the collections are for sale, but others are not yet, so keep that in mind. This tea towel design is not yet for sale. Now, go out and make any sour lemons turn into a wonderful and sweet life. Remember this all next week (and always) of how much your own mother makes your life sweet . . . and let her know it! Now that's one good way to advertise your shop! Your entry looks really good, so even just by participating, you're sure to get some attention to your craft. And even if you didn't win, you're sure to get plenty of new fans and followers, which was the idea to begin with. Opening a business like this needs a lot of creativity; without it, you won't get noticed, or won't have anything to sell in the first place. In this market, doing something that's attention grabbing, in a good way, is a great marketing strategy. Regardless, I do hope you win. Have a good day!